Huge news. Apple has just been awarded an exclusive contract by the government of Kazakhstan to provide computers to all government offices and schools. It’s a five-year deal worth hundreds of millions, possibly billions of dollars. We’ll be putting out a press release later this week. 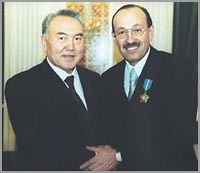 Above is a photo of our Central Asia regional director, Yuri Yobtvoyumat (right), with Nursultan Nazarbayev, the president of Kazakhstan, just after signing the deal. This is what I’ve been trying to hint at lately with the Borat bashing posts. Let me explain. The deal came down to us versus Lenovo. As you know, Lenovo is basically IBMers. As you may not know, IBMers, despite their clean-cut, All-American boy image, are in fact the dirtiest, skeeviest SOBs in the world when it comes to fighting for deals. They’ll do anything. In this case what they did was throw up a bunch of phony Web sites and blogs where they planted all these articles claiming that I was great friends with Sacha Baron Cohen and that Apple Computer had funded the Borat movie and helped edit the film. I don’t know what kind of sick, depraved a-hole puts up a fake Web site and starts making up lies about people. But anyway. We had to counter this. Yuri struck on the idea of using my blog. We decided I’d start bashing on Borat, and Yuri would make sure those items were seen by the right people in the government. We also set up a few other blogs where we claimed Lenovo is filled with CIA spooks who are trying to infiltrate the Chinese government, just as the Chinese are using Lenovo to plant their own intelligence spooks into the United States, and did Kazakhstan really want to get in the middle of all that? Did they really want the Chinese and the Americans sending spies into their country in the guise of computer salesmen? Ha! Yuri’s guys even took photos of the Lenovo guys and invented fake CIA “dossiers” about them. Take that, Lenovo! Anyhoo. I’m starting to realize these blogs can actually be a competitive weapon. And a CEO blog can be more than a vanity thing; it can be a sales tool. Because, no lie, those Borat-bashing posts put us over the top. Today, just hours ago, the Kazakhs signed the deal. Special shout-out to Sacha Baron Cohen, who was a total mensch about the whole thing. Sacha (who by the way totally loves our new MacBooks) actually is an old pal of mine, and knew about the whole thing in advance. “Hey, business is business,” was how he put it. He even helped write some of that stuff bashing himself, and really got into it. That’s just the kind of class act he is. Well done, Sacha. I owe you big time. Go into any Apple store, pick out as much stuff as you want, and tell them to charge it to me. Jankuem!